Town of Niagara, NY - Young Genius: Colonial Village Elementary 3rd grade students Olivia Scozzafava and Hailie Watson, both 8, show off their invention "The Dog Next Door." They devised a way for dogs to see what's happening on the other side of a fence using plexiglass or screening. They and classmates participated in the Invention Convention, a way to promote students problem-solving and creative-thinking skills. Colonial Village Elementary School is holding its Invention Convention on February 8th. 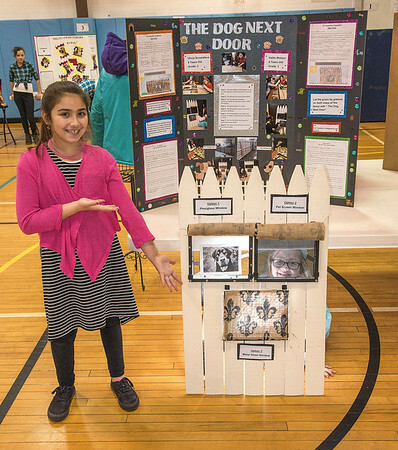 The Invention Convention is designed to promote students’ problem-solving and creative-thinking skills. Students followed a step-by-step process to invent a new product or develop a new twist on an existing invention.